Inferno! Volume Three showcases some of the best new fiction from across Games Workshop’s many universes: from the warrens of the Underhive of Necromunda, to the besieged Mortal Realms and the deadly gridiron of Blood Bowl pitches, through to the galactic struggle for survival in the Dark Imperium. Now part of Inquisitor Covenant’s retinue, former Magos Glavius 4-Rho recounts a haunting tale from his past. 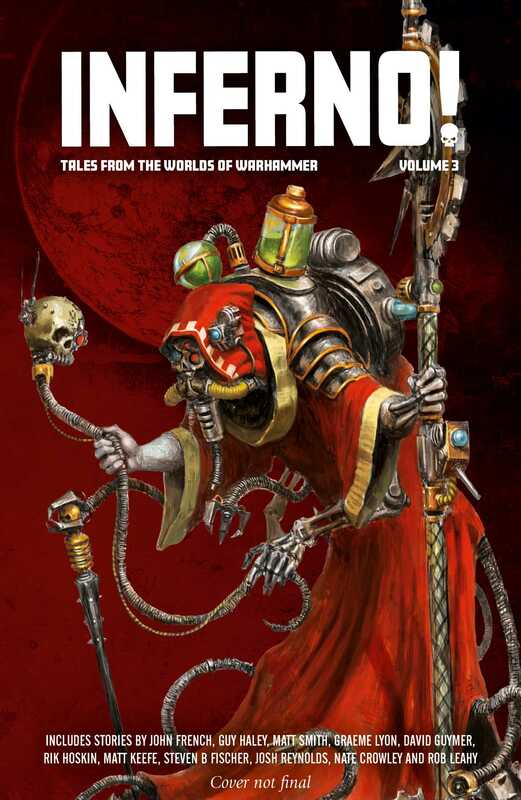 Taken to the mysterious Forgeworld Zhao-Arkkad, his confidence demanded on pain on death, Glavius finds himself immersed in secrets that go to the highest ranks of the Martian Priesthood. Trapped by the raging storms of Shyish, it is Prince Maesa’s turn to tell a tale. Maesa provides the story of how the unlikely duo came to be. Grief stricken by the loss of his wife, Maesa walked the realms in isolation. That was, until, he came across a village whose children were being taken by the forest that once protected them. Blood Bowl pitches are a dangerous place at the best of times, but when a score of murders leaves the Talabheim Titans understrength, blitzer Juliana must investigate to protect her team. Disturbingly, each corpse has been found in their starting position, brutally and ritualistically dismembered. Is this a ploy by their local rivals the Talabec Taleutens to give themselves an edge? Or, is something much more sinister afoot? Plus many more stories from both new and existing Black Library authors. John French is the author of several Horus Heresy stories including the novels The Solar War, Praetorian of Dorn, Tallarn and Slaves to Darkness, the novella The Crimson Fist, and the audio dramas Dark Compliance, Templar and Warmaster. For Warhammer 40,000 he has written Resurrection and Incarnation for The Horusian Wars and three tie-in audio dramas – the Scribe award-winning Agent of the Throne: Blood and Lies, as well as Agent of the Throne: Truth and Dreams and Agent of the Throne: Ashes and Oaths. John has also written the Ahriman series and many short stories.